As part of my ongoing Mapping Manchester research I am focusing on understanding the diversity of the representations of the geographical extents and spatial imaginaries of significant pieces of infrastructure in the city. The Manchester Ship Canal is a key infrastructure of interest, and in the past I put up a set of scans of historic maps and plans online. These have proved to be quite a popular cartographic resource. More recently I have come across some lovely information graphics from the 1920s and 30s promoting the Ship Canal through a range of spatial portrayals of the power of the infrastructure. These are part of the Greater Manchester County Record Office archives I think and have been scanned and put online in flickr as part of the Manchester Archive Plus initiative. 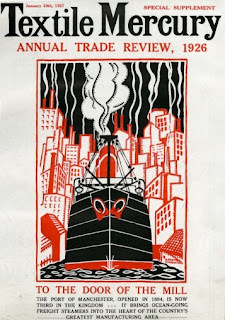 Some of the most effective were produced for the Textile Mercury, including the striking example shown above, which is reminiscent with Soviet-era propaganda with the inhuman scale of ship steaming towards you and the huge red edifice of smoking industrial chimneys. Check out the rest of them here.